The Lakeland Terrier is one of the many Terrier dog breeds that has originated in Northwestern England in the Lake District of Cumberland in the 19th century. They have descended from old English Black and Tan and Fell terriers. The Lakeland terrier have over the years been used for getting rid of the foxes and even despite being bold and courageous, it remains a soft and affectionate companion. It is most suitable to be kept as a family pet because of his jolly and loving nature. This dog tends to develop behavioral problems if not given the proper training and thus despite being cautious, brave and independent, it is not advisable for new or average owners. The Lakeland terrier is reserved around strangers; but gets along well with dogs and may also get along with cats if given socialization at a young age. It is important to note that it loves to quarry moving objects and thus should not be unleashed if not in a fenced area. Energetic, high-spirited and fun loving, the breed gets along with children but need forceful training because of being very lively and somewhat aggressive. They love digging and guarding their belongings. Even though they do not shed much hair, they do need grooming frequently. A professional is needed for hand plucking the hair thrice a year. Moreover, the beard of the breed should also be cleaned on a regular basis. They are a double coated breed which makes grooming difficult. This robust breed gets bored with repetition and thus a variety of firm training techniques are required in order to make him well mannered. This breed is very active and thus is most suited to a house with a small to medium yard; however, it will survive without one as well. This breed does extraordinary in agility and enjoys jogging and running. 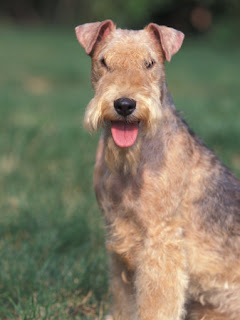 Lakeland Terrier is a healthy breed and lives on an average for 10 to 12 years. Some of them may even live up to 16 years of age.